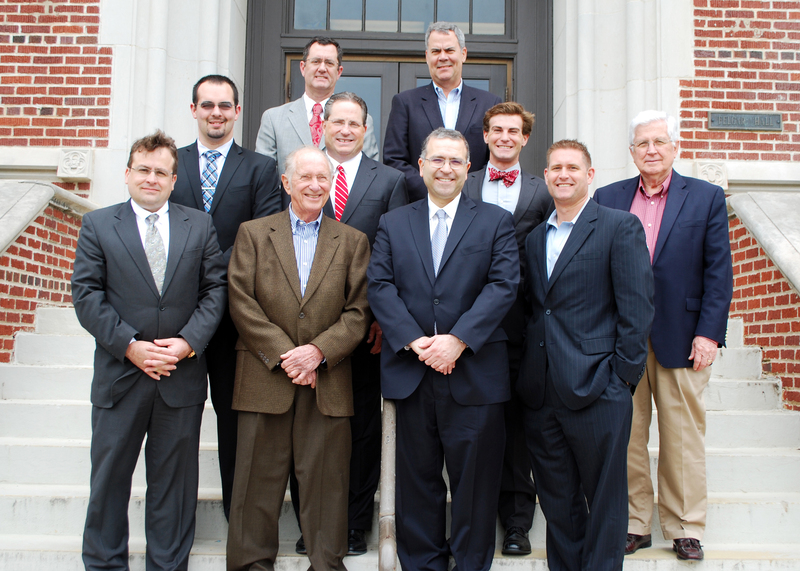 The School of Aerospace and Mechanical Engineering Board of Advisors attended their annual spring meeting on Friday, April 24, 2015. The BOA had a busy day with a full agenda. They held their meeting in the Hitachi Conference Room in Felgar Hall. In addition, they attended the Senior Luncheon at the Fred Jones Jr. Museum of Art. Dave Bert, BOA Chair, was the keynote speaker for the event. Thank you to all for making the day a success! 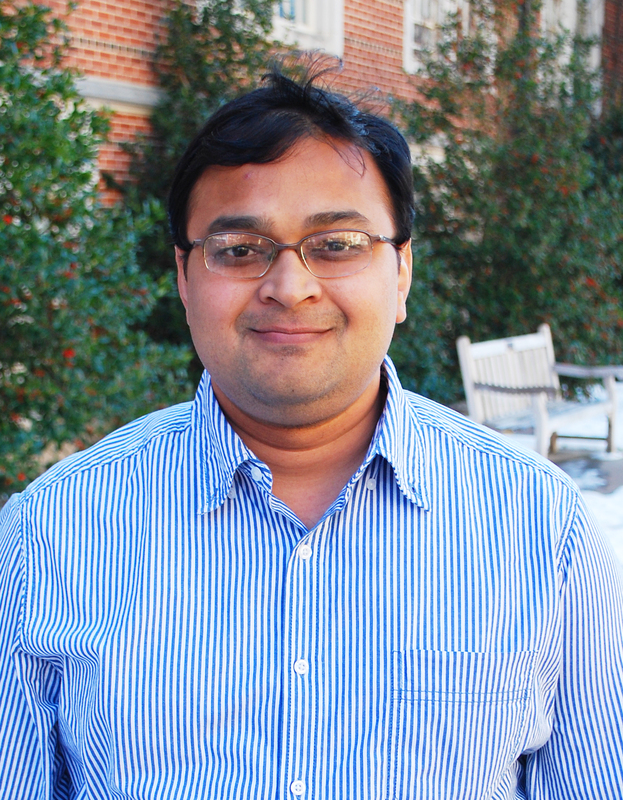 Dr. Jivtesh Garg, AME Assistant Professor, and fellow research members recently developed a model that explains how heat flows between objects separated by gaps of less than a nanometer. The team has developed an atomistic framework that successfully predicts the magnitude of heat transfer across all gaps ranging from finite sizes all the way to perfect contact. The work overcomes the shortcomings of previous continuum based models which predict a diverging behavior at short length scales. Through this model the team demonstrated that at gaps of few atomic layers, lattice vibrations (phonons) can tunnel through (normally associated with conduction heat transfer) in addition to heat transfer through evanescent electromagnetic modes (near-field radiation) blurring the separation between conduction and radiation at short length scales. By using microscopic Maxwell’s equations energy transfer was directly expressed in terms of short-range forces and long-range Coulomb forces between atoms on either side of a gap avoiding the need for use of any bulk macroscopic properties such as the dielectric constant. Such a purely atomistic framework of describing heat transfer can also benefit from ab-initio calculations that provide short-range interactions through solution of the underlying quantum-mechanical problem. The work has implications for practical applications where heat transfer at small gaps is becoming increasingly relevant such as heat-assisted magnetic recording and nano-structured aerogel materials. By providing an accurate atomistic description the work also paves way for development of non-local dielectric constant which can be integrated into continuum models allowing an easier prediction of thermal transport at these small gaps. The research team is made up of Vazrik Chiloyan, Massachusetts Institute of Technology; Keivan Esfarjani, Rutgers University; Gang Chen, Massachusetts Institute of Technology; and Jivtesh Garg. To view the paper regarding the team’s work, please click here. Additionally, the team’s work was recently featured in MIT News. 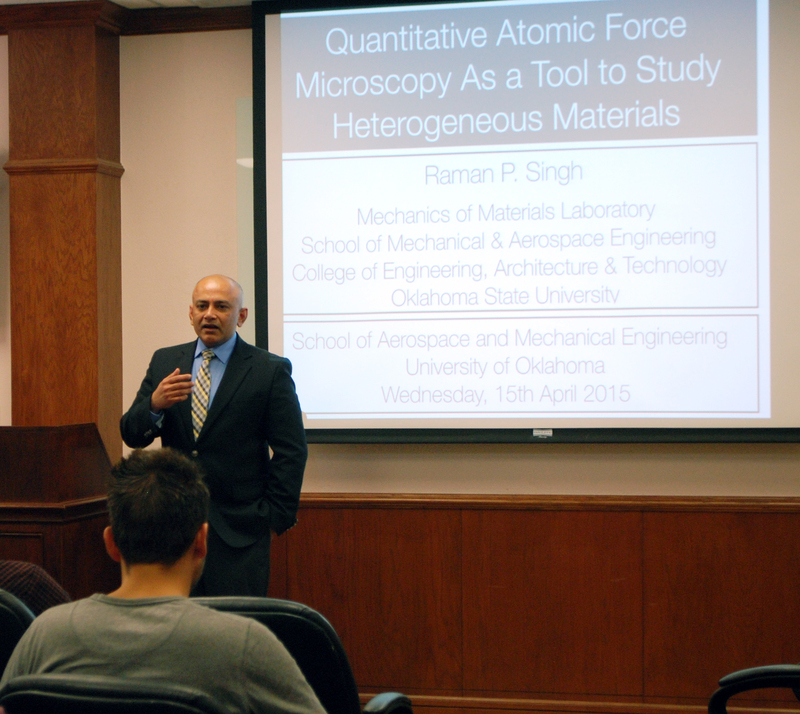 On Wednesday, April 15, 2015, Dr. Raman P. Singh visited AME for a seminar presentation. His seminar was titled, Quantitative Atomic Force Microscopy as a Tool to Study Heterogeneous Materials. Dr. Singh visited from Oklahoma State University where he is the Associate Dean of Academic Affairs, Director of the Helmerich Research Center and C.F. Colcord Professor in the College of Engineering, Architecture and Technology. Bio: Dr. Raman P. Singh is a C.F. Colcord Professor of Mechanical & Aerospace Engineering and currently serves as the Associate Dean for Academic Affairs for the College of Engineering, Architecture and Technology at Oklahoma State University. He is also the Director of the Helmerich Research Center at the OSU-Tulsa campus. He holds M.S. and Ph.D. degrees in Mechanical Engineering and Applied Mechanics from the University of Rhode Island and a B.Tech. degree from the Indian Institute of Technology from Kanpur, India. Prior to joining OSU in 2006, Singh was a faculty member at the State University of New York at Stony Brook. Before working in New York, he was a post-doctoral scholar at the California Institute of Technology. Singh’s academic interests are in student mentorship, development and retention with a focus on new pedagogical methods. 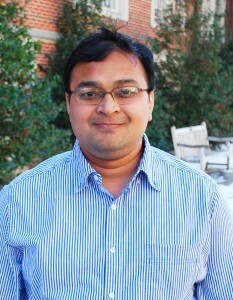 His research interests are in the mechanics of advanced materials with an emphasis on the investigation of modern engineered materials and development of new techniques for mechanical characterization at highly localized length scales. Besides academia, Raman enjoys road-trips, being a life-long student, photography and spending time with his two daughters. Abstract: This seminar presented the use of quantitative atomic force microscopy based indentation to characterize the mechanical properties of a carbon fiber–epoxy matrix interphase at highly localized length scales. Atomic force microscopy is a valuable tool for qualitative characterizations of material surfaces. Nonetheless, its application to quantitative measurements is hampered by various technical issues. Accordingly, the talk will discuss how issues such as spring calibration, tip geometry, surface roughness and substrate effects were taken into account to obtain accurate quantitative mechanical proper ties of interphase region. Lastly, the seminar discussed the use of surrogate modeling to characterize non-linear viscoelastic materials based on inverse analysis of indentation data. In this form, the technique can be extended to study mechanical properties complex biological structures such as the ear-drum (or tympanic membrane) or the heart wall. Congratulations to Celeste Clary as she was named the Outstanding Underclassmen Student during the Society of Women Engineers (SWE) Week. 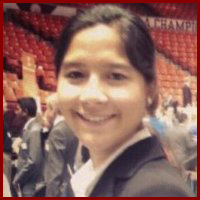 Celeste is a sophomore studying mechanical engineering. She is from League City, Texas. Congratulations from all of us at AME! Keep up the great work! 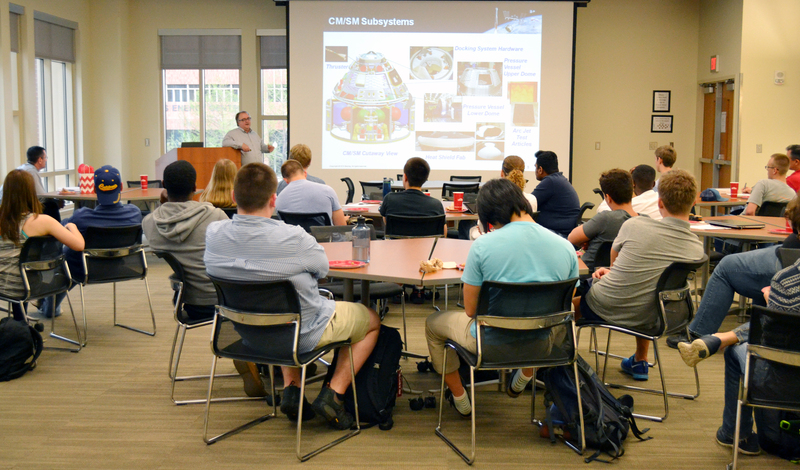 On Monday, April 6, 2015, the Space Systems and Mission Design class of the School of Aerospace and Mechanical Engineering hosted Mr. Keith Reiley, a Boeing Project Manager. Mr. Reiley spoke with students about current projects and advancements in the space industry, including some current projects at Boeing. Mr. Reiley is a University of Oklahoma graduate from 1982 with a degree in Engineering Physics. Keith Reiley is currently the Boeing Commercial Crew Transportation System Program Manager. He has been managing the development efforts for Boeing’s Commercial Crew program since it’s inception in 2009. Prior to working at Boeing, Mr. Reiley was Director of the NASA ISS Mission Integration office, responsible for overall configuration and assembly planning, management of assembly missions and integration of international partners. One of the remarkable legacies and contributions of AME is its significant interaction with industry. For over 100 years, our graduates have been a part of many well-respected companies. Our curricula and research activities have been helpful in building partnerships with industry. The collaboration of the internationally reputable Combustion and Flame Dynamics Lab at AME and John Zink Company is an example. The John Zink Company is an Oklahoma based a worldwide leader in burner manufacturing. In an effort to ensure that the next generation of energy and technology leaders will come from our graduates at the University of Oklahoma, a memorandum of understanding between the OU College of Engineering and John Zink Company was signed in 2007 through which funds are made available to support graduate students in the field of combustion. The memorandum was signed by Dr. S. R. Gollahalli, then Director of AME and head of the Combustion and Flame Dynamics Lab and Dr. Joseph Colannino, then Director of Research and Development of John Zink Company. The company founded in 1929 by John Steele Zink (an OU graduate), currently a division of the Koch group of companies, is a leader in the design and development of flares, process burners and boiler burners. Since 2008, sixteen graduate students have been supported with the annual funding provided by John Zink Company. These students, designated as “John Zink Company Scholars,” are honored with individual awards from John Zink Company and certificates from AME. The students also take one of the several short courses on combustion that are offered at John Zink Company in Tulsa. In addition, their names are engraved in a plaque in Felgar Hall. John Zink Company is notified when the students are ready to graduate to provide the company with an opportunity to recruit them. The generous gift from John Zink Company has been helpful to the success of our AME graduate students in the field of combustion. Past John Zink Scholars are enjoying successful careers in industry (John Zink Company, Boeing, Schlumberger,) and academia (University of Texas-El Paso). 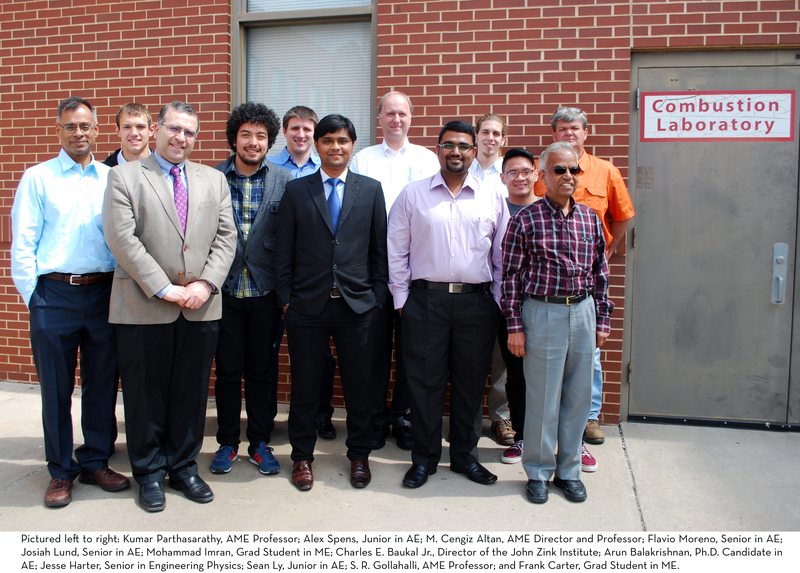 For the past several years, Dr. Charles E. Baukal Jr. has visited AME with some of his colleagues to present awards to the John Zink Scholars. Dr. Baukal is the director of the John Zink Institute and has been with John Zink Company since 1998. 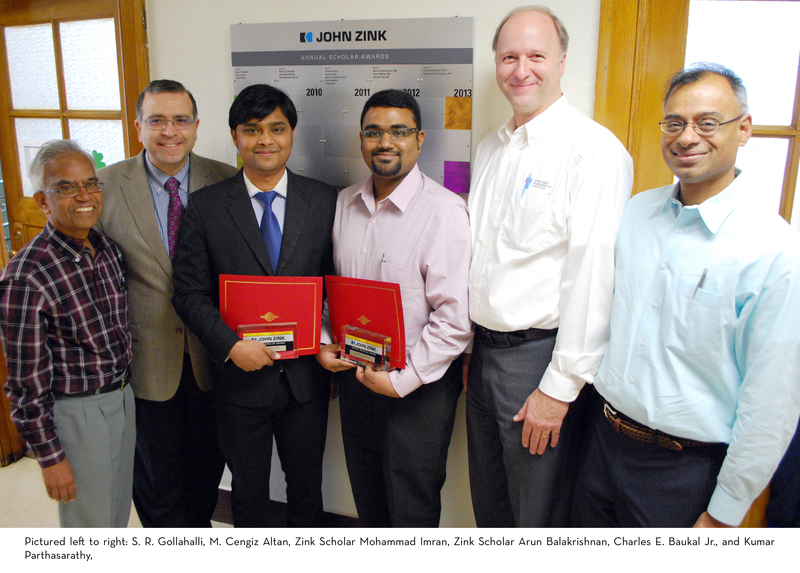 On March 27, 2015, Dr. Baukal presented awards to the John Zink Scholars for 2014-2015, Arun Balakrishnan, Ph.D. in Aerospace Engineering, and Mohammad Imran, M.S. in Mechanical Engineering. 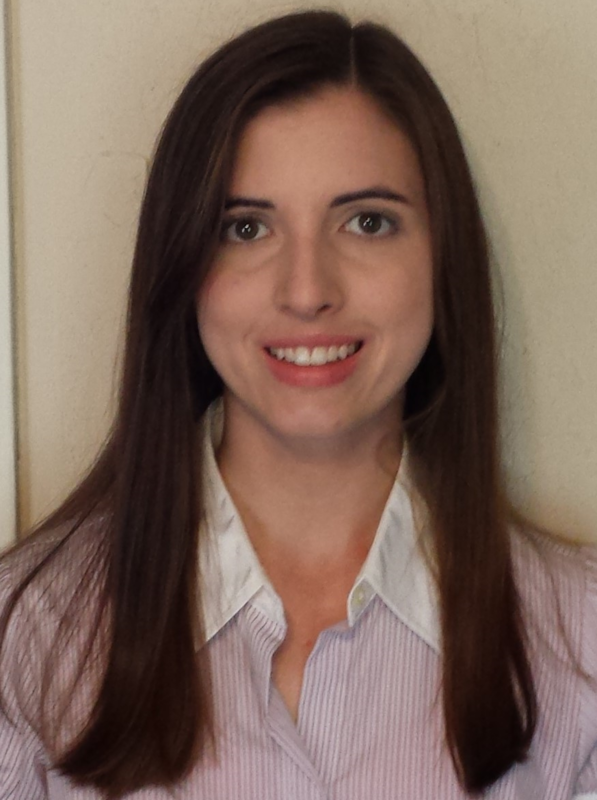 AME Graduate Student Amber Kapoor was recently selected into the 2015 National Science Foundation (NSF) Graduate Research Fellowship Program. Amber will receive a stipend of $34,000 towards her research. Amber is a Ph.D. Candidate in Mechanical Engineering. Her research interests include alternative energy and sustainability, specifically HVAC efficiency and controls. 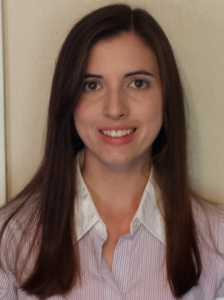 Following the completion of her Ph.D., Amber hopes to work in the energy industry contributing to sustainability research.